YOU MUST BOOK ONLINE TO AVOID MISSING OUT. For Easter Egg Hunt Extravaganza, simply book your experience (Treetops, Bikes, Littlies Forest) and the Egg Hunt booking option will be visible to you. If any problems, call us for assistance. Treetop courses, beautiful shady relaxing walks and three easy bike trails (BYO or hire), visit our wallabies or relax at the outdoor forest cafe whilst others are on the main challenge courses or the kiddies adventure course. Now also a Kiddies Forest Adventure course! Very easy and beautiful forest single trails for all ages. No *#! ** moments, we promise! Now 2 Swamp wallabies (Shrek & Fiona) and 2 Red Neck wallabies (Jannali & Vincent). Soooo cute! Kinglake Forest Adventures is an adventure and nature oasis perfect for the young & the young at heart. Offering treetops, zipline, high ropes, freefalls, kids birthday parties, teambuilding & outdoor activities, Kinglake Forest Adventures is perfect for your next weekend adventure. Only 60 minutes from Melbourne, come visit us for your next outdoor adventure and put some daring action into your weekend. Our on-site cafe is also the perfect place to relax whilst the kids (or mum and dad) are enjoying the highs of our treetops and zipline adventures, or to catch your breath after all the excitement finishes! With homemade snacks, local award winning pies and pasties, and Kinglake’s best coffees, there is sure to be something to your satisfy your appetite at Kinglake Forest Adventures. Or BYO and have a picnic on our beautiful picnic tables overlooking the incredible forest. Celebrate birthdays, team success and life with a little adventures. Organise the party of the year for your child at Kinglake Forest Adventures. Our treetop and zipline adventures are perfect for hosting a party with a difference, and will leave the partiers happy and exhausted after an amazing day! 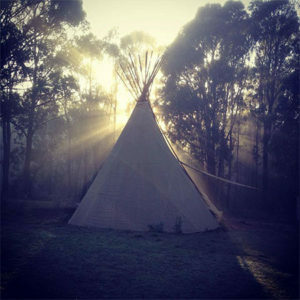 Enjoy a private tipi included and BYO or provided food for your next birthday party at Kinglake Forest Adventures. Only three tipis so book well in advance!